L.H. Field and T. Matheson, Chordotonal Organs of Insects. M. Sugumaran, Unified Mechanism for Sclerotization of Insect Cuticle. H.H. Hagedorn, D.R. Maddison, and Z. Tu, The Evolution of Vitellogenins, Cyclorrhaphan Yolk Proteins and Related Molecules. C. Wu, J.J. Renger, and J.E. Engel, Activity Dependent Functional and Developmental Plasticity of Drosophila Neurons. Subject Index. Insect physiology is currently undergoing revolutionary changes with the increased application of molecular biological techniques to investigate the molecular mechanisms underlying the physiological responses to insect cells. Advances in Insect Physiology is committed to publishing high quality reviews on molecular biology and molecular genetics in areas where they provide an increased understanding of physiological processes in insects. 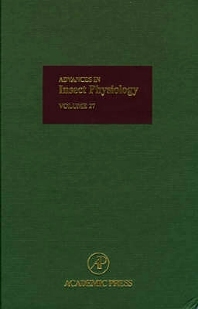 Volume 27 of this classic series continues to provide up-to-date reviews on topical subjects of importance to all invertebrate physiologists and neurobiologists and contains increased coverage on the molecular biology of insect physiology. Insect and other physiologists; neuroscientists; zoologists, entomologists, and insect biochemists. The University of Cambridge, U.K.